Microfiber sheets are warm and cuddly in winter and cool in summer - like a cozy t-shirt. What's more important is that it will insure that you and your close ones have a good night sleep. We spend third of our lives in bed so why not make sure that we spend it in comfort. 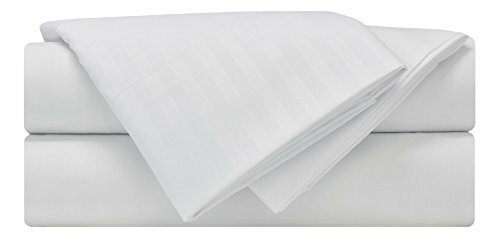 Besides with Mezzati sheet sets you don't need to spend a fortune like you would on some other luxury linens. Wrinkle and Fade resistant, machine wash in cold water. Tumble dry on low. Mezzati Luxury Linens offers the Highest Quality Brushed Microfiber on the Market! Choose Quality - Choose Comfort! Order now while supplies last! King Size 4pc Set - 1 flat sheet (102" x 105"), 1 fitted sheet (78" x 80"), and 2 king size pillowcases (20" x 40"). Our set comes with deep pocket fitted sheet with elastic all around. Fits mattresses up to 16"
Striped 1800 Prestige Collection Brushed Microfiber - Top Quality and Affordable with Soft Silky Touch, Breathable and Hypoallergenic. Wrinkle and fade resistant. Perfect for bedroom, kids room - boys or girls, guest room, RV, vacation home, dorm room, bed in a bag addition. Great gift idea. Hypoallergenic and resistant to dust mites. Breathable, durable and attractive. Brushed microfiber fabric is softer and lasts longer than cotton. Easy Care - Wrinkle and Fade resistant, machine wash in cold water. Tumble dry on low. The feel of pure comfort. For those who love the sheets. Not just any sheets but great sheets. If you have any questions about this product by Mezzati, contact us by completing and submitting the form below. If you are looking for a specif part number, please include it with your message.